Lawn care is easily the most important thing you can do in your yard to convey a groomed, clean, beautiful maintained appearance. But easy is hardly the word to describe lawn maintenance! 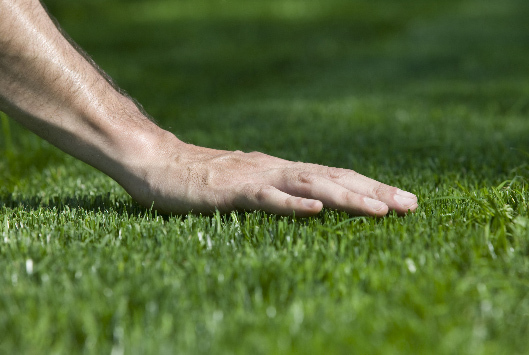 If you're the type to care for your lawn yourself, you know it's often a losing battle! Between mowing, seeding, watering, and the dreaded grubs, weeds, and crabgrass, it may seem like sheer luck over green-thumb skill to cultivate a golf-course style lawn! Busy schedules - especially in our short spring and summer months, leave little time for the attention needed for adequate lawn care. With everything that needs to be done to keep your lawn beautiful, lush, green, and inviting, you might need a small army! If done properly, the average homeowner can often spend more time caring for their lawn than many other summer activities combined - an exhausting notion, and one that certainly can feel like precious time wasted! Trusting a company to handle all your lawn care and maintenance will not just free up your time - it will relieve constant worrying and planning to assure each step is done at the exact time. By letting us do the worrying, planning, perfectly timed execution, and ongoing maintenance, you'll have the lawn of your dreams - and your neighbors' jealousy! In this area, summer is short and precious. Don't spend another sun-filled moment worrying about your lawn. Count on us for all your lawn care and maintenance, and spend your precious time doing the things you really want to do this spring and summer! At some point, every homeowner will have to contend with pests. These predators can wreak havoc on all your hard work by eating your beloved annuals and perennials, creating holes in your lawn, and property, attracting other predators like crows or rodents, or taking over your lawn with crabgrass and dandelions. Whether they are simple as pesky weeds, more complicated, like insects invading your harden, or seriously detrimental like rodents burrowing tunnels underneath your property, we can be of assistance while you take on these nasty living creatures and critters. Our company uses the latest technology to rid your lawn, garden, and yard of pests. We use pesticides to assure your lawn is one step closer to making your property look like the meticulously manicured golf course you long for. We'll assess the issue, and determine which chemical will be best for the job. We use products that will kill the pest (weed, insect, or animal) while maintaining the life of your lawn, garden, trees, and other features you want spared. We also utilize other methods of pest control in a more organic way, for those interested in this specialty. Whether you have children, pets, or just strive to live a greener (pun intended!) life, we can help. If the job is out of our scope of service, we'll refer you to the right pest control company who can help you with your pest problem through methods like trapping, caging, and non-kill relocation.